Platinum Games' Hideki Kamiya delivered an ultimatum to Nintendo on Twitter this morning. 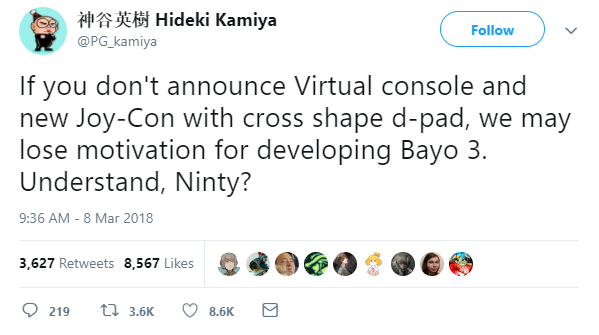 If today's Nintendo Direct doesn't show us the Virtual Console (or whatever Nintendo has planned for the Switch's version thereof) and a Joy-Con with a d-pad option, he might lose motivation to work on Bayonetta 3. Kamiya is infamous for blocking people on Twitter for the slightest perceived provocation, so there's a chance roughly 50% of our readership wouldn't be able to see an embed. I'll go ahead and copy / paste the relevant tweet. Kamiya is certainly joking (uh, I think), but let's be honest, Bayonetta 3 is a hell of a bargaining chip. Nintendo…give him what he wants. By the way, third parties sell d-pads for Nintendo Switch Joy-Cons, but they're DIY options that require you to tinker with your hardware. I'm not about to take that risk. Give me an official option, Nintendo. #IStandWithKamiya. Tagged with News,	Nintendo Direct,	Nintendo Switch,	Platinum Games.